A 30-minute shot from Tampa airport, it’s quite a sight driving up the steep rise of the entrance to the Loews Don CeSar Hotel’s grand porte-cochere entrance. 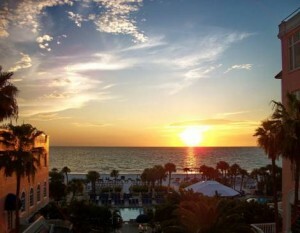 Silhouetted against the bright Florida sky, the hotel can be seen from miles around. 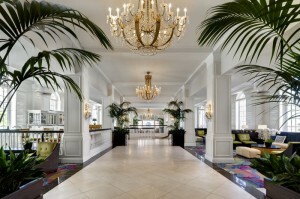 It blends European grandeur and seaside elegance into an enchanting experience reminiscent of yesteryear. Alternately dubbed “The Don,” the “Pink Palace” and the “Pink Lady,” the hotel celebrates its 86th anniversary in 2014. It all began with a story, one of lost love. While attending university in England, Rowe saw a Spanish opera singer named Lucinda in a production of Maritana. He fell madly in love. The two met regularly after her performances at an ornate fountain near the Royal Opera House. However, their plans to elope were foiled by her parents. Rowe completed the hotel as a tribute to Lucinda on 80 acres of land south of St. Petersburg in 1928. He named it after Don Cesar de Bazan, the hero of the opera Maritana. In the lobby Rowe placed a replica of the fountain at the London opera house. Although the fountain no longer exists, hotel employees spin tales of seeing a couple who appear walking hand-in-hand. The gentleman is dapper in a white suit and Panama hat, the young lady is a dark haired beauty. They walk through the hotel and then disappear. The “Don’s” pink façade is as colorful as its former and future guests. 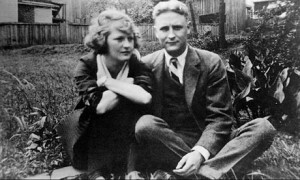 During the Jazz Age it quickly became a favorite romping ground drawing big-timers like Al Capone, Lou Gehrig, Franklin D. Roosevelt, lawyer Clarence Darrow and novelist F. Scott Fitzgerald with his beautiful dancer wife Zelda. Rowe could often be found sitting in a high-backed chair in the lobby smoking a cigar of medicinal herbs, a prescription from his doctor for his ill health. One day in 1940, Rowe collapsed in the hotel lobby. He refused to go to the hospital, instead taking a sick bed in two rooms on the hotel’s first floor. He died there a few days later. 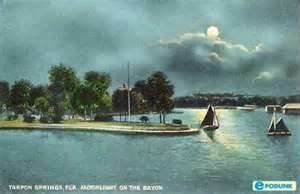 Rowe’s estranged wife of thirty years inherited the property and soon it lost much of its charm and personality. During World War II the hotel was purchased by the U. S. Army and converted into a military hospital. Later it became a convalescent center and headquarters for the Veterans Administration. By the early 1970s the once grand hotel had become an eyesore, headed for a date with the wrecking ball. But a group of preservationists formed a “Save the Don” movement and found a new buyer that reopened it as a luxury resort on November 1973, beginning a second life. 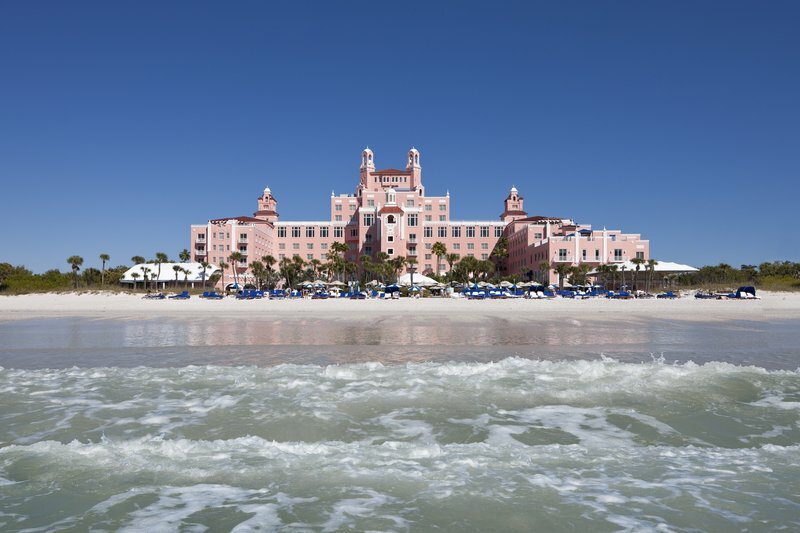 Loews Hotels & Resorts assumed management of The Don CeSar Beach Hotel in 2003, and has completed several enhancement projects that totaled $12 million to date. Inducted into the National Registry of Historic Buildings in 1975, it is one of three building landmarks used by the National Maritime Association on its maps as navigational aids for sailors. Among the recent illustrious names appearing in the hotel register have been Presidents Jimmy Carter and George Bush. So too are the names of Mariah Carey, Justin Timberlake, Mick Jagger and Tom Petty, to name a few. On a recent February visit my wife Jane and I enjoyed a delightful two-night stay. Its “bones”– Carrara-marble floors and oak beamed ceilings– have remained untouched over the years. Posh doesn’t begin to describe the 277 room grand hotel. It is fun and relaxing, indulgent and captivating. The butter-colored walls turned a Tuscan gold, taking on the shades of the Don pink, when we opened the curtains during daylight hours. Many of the rooms and suites offer spectacular views of the azure water and pristine Gulf beaches or Boca Ciega Bay. In the evenings blazing lights fill the hotel’s great arched Palladian windows, while bouquets of vibrant flowers decorate the lobby and hallways. The sparkling Spa Oceana and the SalonTouch Studio, an $11 million addition, features over 11,000 square feet of facilities, luxurious spa treatments and full service salon. The Don has three restaurants and a stunning rooftop garden overlooking the Gulf of Mexico. A poolside bar is tucked between a pair of deluxe beachside pools. 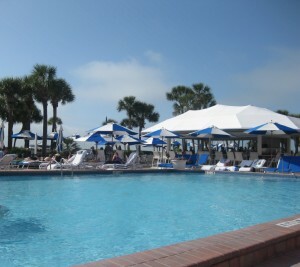 Take a walk from the pool deck and have some fun with yoga on the white, sugary sand. Go sailing, cruise on wave runners or glide along the Gulf in an ocean kayak to take in the pink castle from a different view. It’s a short 15-minute drive into downtown St. Pete. 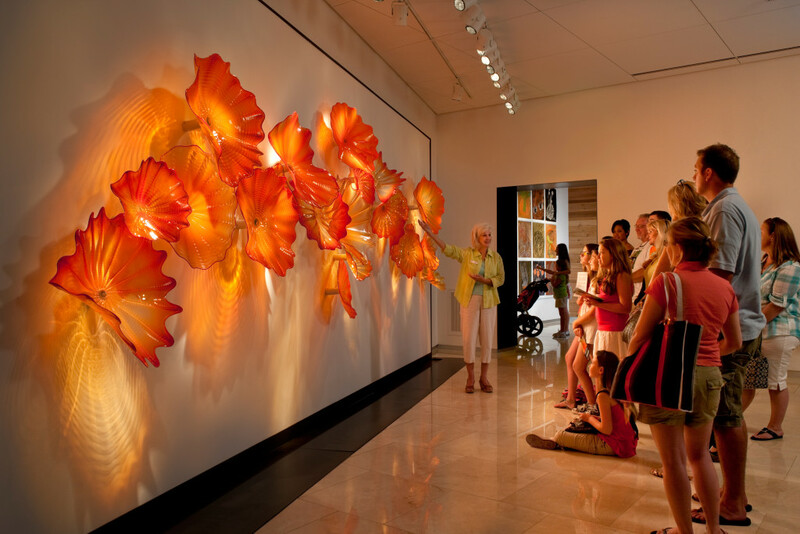 Powered by its sprawling waterfront, the stunning Salvador Dali Museum and other eclectic arts venues, trendy dining options and a cluster of new brewpubs, St. Pete is living large. So much so, earlier this year it was tabbed among the “52 Places to Go in 2014” by the New York Times. It clocked in at No. 49, just ahead of Belize, New Caledonia and Niagara Falls, N. Y. After a day of exploring, we dined at the Don’s Maritana Grille. The ambiance is gracious, the staff is seasoned, and the food is designed to appeal to both foodies, and those not so obsessed. 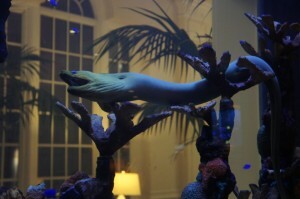 We settled into one of the banquettes, scoring a table next to Cesar, the Grille’s iconic green eel with electric purple eyes. The lovely soft palette of the decor compliments the soft lighting. But, the food is king here from the amuse bouche bite of steak spring roll with mango walnut aioli to the white chocolate “reveal” dessert, thanks to the creativity of Executive Chef Kenny Hunsberger and the uber-talent in his kitchen. For the dinner courses, we put ourselves in the hands of Chef Patrick Gossett and special props to Jeff, our waiter and certified sommelier. A perfect bite of blini layered with creme fraiche and Sarasota sturgeon started our meal and then we moved into tasting plates of perfectly seared cobia seasoned with saffron, sea bass served over white bean cassoulet with thin slices of housemade venison sausage, local prawns and scallops, followed by a truly lovely entremet of cucumber and cracked pepper sorbet with black truffle oil. All plates were served with paired wines from an extensive wine list. We capped it off with the Reveal dessert. Warm maple syrup is poured over a dinosaur-sized white chocolate egg which cracks open revealing a bit of almond cake and lavender ice cream, vanilla mousse and lemon curd. Not kidding. Video the experience, it’s a showstopper. On another evening we caught the sunset along with crafted cocktails at their Sunsets Tequila bar, featuring more than 40 tequilas. Joined by longtime St. Pete family friend Philip McCleod, we enjoyed a pair of wood-fired flatbreads—one with anjou pear, duck bacon, maytag blue, praline pecans and the other with chorizo and shrimp, caramelized onions, fresh basil, and garlic chardonnay butter. The lobby bar is in the epicenter of the iconic Don where guests and locals turn up to relax and unwind to the lively piano music. I closed out our visit sipping on a St. Pete Steed, a splendid creation “stirred” up by our mixologist Christy. Served in a lustrous copper mug, it’s the Don’s twist on the traditional Moscow Mule with Russian vodka and topped with egg white foam and lime zest. For the past fifteen years I’ve been a contributing writer to a variety of national & regional magazines, daily newspapers and websites. I have written about an array of topics such as arts & culture, chefs, food & drink, business entrepreneurs, travel, history, thoroughbred racing, and the animal and natural world. Most recently my work has been published regularly in Blood-Horse, Long Island Boating World and The Hunt and PA Equestrian magazines. I've also contributed articles to the Philadelphia Inquirer and Daily News, the Delaware County Times, and the Montgomery County Newspapers. I have been an Arts & Culture correspondent for Newsworks, the website for WHYY-TV (PBS in Philadelphia). I have written regularly for ESPN.com, America's Best Racing, the Paulick Report and Thoroughbred Racing Commentary. I am a regular contributor to the following top-flight travel websites: JustLuxe, JustSayGo, Gallaghers Travels and SeeTheSouth, as well as the International Food, Wine & Travel Writers Association website. After spending the past two decades in Wilmington, Delaware, my wife Jane, our Toller retriever Smarty have moved to Melbourne Beach, Fla. Through my writing over the past decade I have traveled to spectacular destinations such as Lake Tahoe, Calif./Nev. and Sun Valley, Idaho; Cody, Wyoming/Yellowstone Park; Saratoga Springs, the Adirondacks, Saratoga Springs and Rhinebeck, New York; Port Clyde and Monheghan Island, Maine; Avalon and Stone Harbor, New Jersey; Middleburg, Charlottesville and Richmond, Virginia; Tampa and St. Petersburg, Anna Maria Island and Longboat Key, Florida; and St. Simons and Jekyll Island, Georgia. My travel articles thoughtfully explore the history of the region along with museums, music and the arts, chefs and restaurateurs, wineries and craft breweries, outdoor and sporting adventures as well as profiling intriguing personalities of those regions. In addition to my writing career I owned a marketing company where I represented a diversified list of clients in the areas of publicity, marketing and business development-- such as the famed Baldwin's Book Barn, Thoroughbred Charities of America and the Kahunaville restaurant chain. In another life I was the founder, publisher and editor of Life Sports Magazine. Along with Jane and Smarty I look forward to writing about new adventures in Melbourne Beach, the "Space Coast" and other Florida destinations. With the help of local Melbourne Beach artisans and tradesmen, the couple spent the next few years returning the residence as closely as possible to Walter Brown’s 1920’s home. Port d’Hiver (Port of Winter) officially opened in 2007. 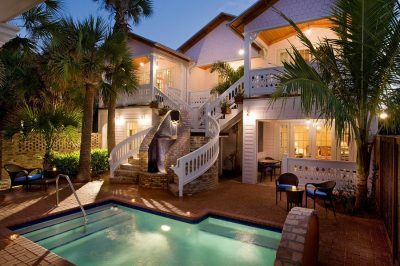 A retreat that is both comfortable and elegant, the B&B offers ten bright, spacious accommodations each uniquely decorated with a tropical Key West/British Colonial flair. The Sunrise room in the north cabana offers fabulous ocean views and a mahogany four poster bed along with a private balcony for cocktails or just relaxing with a good book. Handcrafted Peter Reed British linens made from the finest Egyptian cotton percale add to the luxurious experience.